Aneurysms that occur inside the head (intracranial) are among the very serious neurological conditions which can cause severe Brain injury or death as a result of hemorrhage. To remain healthy, the Brain needs a constant supply of oxygen-rich blood. To deliver this supply, an extensive network of blood vessels, called arteries, carry blood from the pumping Heart to the Brain. In order for the blood to travel up the arteries from the heart and into the Brain where it circulates, the blood is under pressure. Maintaining adequate blood pressure to the Brain requires, among other things, arteries that are not blocked and do not leak. Aneurysms are usually described as weak places on the arteries, which supply blood to the Brain. They form in a manner that looks like a blister. They are similar, in concept, to the weak spot on an inner tube of a car tire or a child's balloon that is over-inflated. This is a Lateral view Carotid Artery Angiogram demonstrating a giant Aneurysm". A special "dye" was injected through a catheter introduced into the arterial system through a groin artery and then "floated" through the Aorta towards the cerebral arteries. In these instances, one knows that it is likely that at some point it is likely that the inner tube or balloon will fail resulting in a "blowout". Unfortunately there is a parallel risk that a patient has who harbors one of these Aneurysms. What is the Incidence of Aneurysms? Aneurysms are present in approximately five percent (5%) of the general population. Although they can occur in children and early adulthood they are more likely to make their presence known in adults between 40 and 60 years. Aneurysms form in particular areas of the Cerebral (Brain) Arteries. These are mostly where the arteries branch (Figure 2). Some of us are born with a very small defect in an elastic membrane which is part of the thick, middle layer of our Brain arteries (See Figure 3.) As a result of the blood pounding on the inside of the artery with each heartbeat, a small internal hernia occurs through the weak and defective elastic membrane. Over the years this internal hernia slowly enlarges to extend outside the wall of the artery and takes on the appearance of a thin-walled blister (See Figures 3 C & D). These arteries have three distinct layers (Figure 3): The outer layer (i) is very thin (called the adventitia). The inner layer (iv) is also very thin (called the endothelium). The middle layer (media) is relatively thick and is made mostly of muscle (ii). Near the center of the media is the elastic membrane (internal elastic membrane - iii). Defects (v) in the internal elastic membrane are more likely to occur where arteries branch. It is through this defect that the hernia of the inner wall of the artery may occur. When the hernia extends through the entire wall of the artery and forms a blister, a true Aneurysm has formed. Unfortunately the Aneurysm wall is made up almost entirely of the thin, inner and outer layers of the arterial wall and does not have the protection of the thick muscle or its elastic membrane to keep the blood from bursting out of the inside of the blood vessel. Figure 2A (Left): Illustration of the component parts of an arterial "Bifurcation". This is where vessels branch or divide. 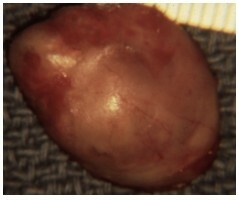 Figure 2B (Right): A saccular Aneurysm arises from the apex of the bifurcation in patients who were born with the defect illustrated in Figure 3. These arteries have three distinct layers: (i) outer thin layer (adventitia); (iv) inner thin layer (endothelium); (ii) thick muscle middle layer (media); (iii) internal elastic membrane; Internal Elastic Membrane Defect (3B-v) occurs where arteries branch; (3C) hernia of the inner wall of the artery through Internal Elastic Membrane defect; (3D) hernia extends through the entire wall of the artery and forms a true Aneurysm with a wall made up of the thin, inner and outer layers of the arterial wall and does not have the protection of the thick muscle or its elastic membrane to keep the blood from bursting out of the inside of the blood vessel. Approximately 15% of Aneurysm patients have two or more Aneurysms inside their head. There are certain factors, which help the experienced physician determine which of the Aneurysms has been the one that hemorrhaged. Sometimes this is a difficult determination to make. In any patient who has more than one Aneurysm, the unruptured one still represents a significant potential threat. There is about a 10% risk to death within 10 years from the unruptured Aneurysm. There are some factors, which increase the likelihood to have more than one Aneurysm. Patients who are under 55 years of age and also suffer with hypertension are twice as likely to have multiple Aneurysms compared to patients who have normal blood pressure. Females are more likely to have multiple Aneurysms than males. Women who are over age 60 and have one Aneurysm are twice as likely to have multiple Aneurysms compared to men of similar age. Increasing age and hypertension are two factors in women that correlate with multiple Aneurysms. There are certain locations of aneurysms (such as Carotid-Ophthalmic Aneurysms), which seem to have a predilection to having a similar Aneurysm on the opposite side. This is almost a mirror-like distribution. These Aneurysms are relatively uncommon. One question that is frequently asked about Intracranial (inside the head) Aneurysms concerns factors of heredity. The neurological and neurosurgical literature on this subject suggests that, "There are some families which have an inherited weakness of the cerebral blood vessel wall which may predispose these individuals to aneurysm formation." The occurrence has been suggested to be a strongly inherited (autosomal dominant) pattern; however, only a few families have been reported. It is suspected that the familial incidence is higher than has been reported; nevertheless, the actual likelihood of this problem occurring in your children is extremely small. Where there appears to be a family history of Aneurysms non-invasive screening methods are available for these other individuals. Coarctation (narrowing) of the aorta  associated with Intracranial Aneurysms in younger individuals including children. Polycystic disease of kidneys  When this is associated with the adult form (bilateral disease), 16% of these patients will have an Intracranial Aneurysm. Fibromuscular disease of the Renal and Carotid Arteries, Marfan's syndrome, pseudoxanthoma elasticum, Ehlers-Danlos syndrome, and Moya Moya disease are all diseases of connective tissue or blood vessels and are associated with increased risks for Intracranial Aneurysms. Almost 60% of patients will have warning signs preceding a major hemorrhage. The interval between the last warning sign and a hemorrhage averages between 6 and 17 days depending on the location of the Aneurysm. The likelihood of having a warning sign varies with the location of the Aneurysm in the cerebral circulation. A serious change in the pattern of headaches or the onset of persistent headaches in someone who rarely is bothered by headaches can be important. The onset of seizures (epilepsy) in someone who has not had seizures previously is very important and should be evaluated by someone knowledgeable in these matters. One "fundamental rule" in Neurology and Neurosurgery is that "NEW ONSET SEIZURES" are presumed to be related to an intracranial structural problem (tumor or aneurysm) and that this DEMANDS INVESTIGATION. Aneurysms represent one of the most serious causes of "stroke". Hemorrhage from a rupture of the aneurysm is the occurrence, which we fear the most about this condition. The hemorrhage may be a small leak or a more catastrophic bleed, which severely damages or destroys Brain tissue. Once a hemorrhage from an aneurysm occurs, 35% of these patients will die no matter what treatment is given. This is in addition to those patients who survive the initial hemorrhage but who have permanent Brain injury as a result of the hemorrhage. It is very important to recognize that not all patients with one or more Aneurysms will have problems from the Aneurysm. Aneurysms are very unpredictable peculiarities. It is generally agreed that, in any population of 100,000 patients who already have Aneurysms, only about 20 of these patients will experience a hemorrhage each year. Of these 20 people, thirty-five (35%) percent will die as a consequence. In those patients who suffer a hemorrhage and survive that experience, there are certain statistical factors, which are recognized and are important to know. Although Subarachnoid Hemorrhage (SAH) comprises only 1% to 7% of all "strokes" (intracranial Cerebrovascular Accidents=CVA), the loss of years of productive life for these patients is comparable to "cerebral infarction" (death of Brain tissue as a result of an obstructed blood supply, as often occurs in older people) because of the relatively younger age of the Aneurysm patient and the generally poor neurological outcome for many of these patients. Once an Aneurysm has hemorrhaged, it is likely to do so again. The patient who suffers an initial hemorrhage is at serious risk to suffer another hemorrhage within 48 hours and again at approximately two weeks after the first hemorrhage. The risk to life (mortality) is greater with each subsequent hemorrhage, as is the risk to more Brain injury. In the event that the patient survives one month from the first hemorrhage without a recurrence, there is about an 80% chance they will survive to one year without treating the Aneurysm. Long-term survival of patients who have recovered from a ruptured Aneurysm (that is not permanently treated) is significantly lower than that of the general population. It appears that there is a little greater than 2% risk per year that the Aneurysm will re-bleed in the first 10 years after the initial hemorrhage. (Approximately 11.5% will have re-bled at five years, 21% will have re-bled at 10 years and 30% will have re-bled at 20 years after the initial hemorrhage.) There is approximately a 3 1/2% risk to death per year for those patients who survive the first hemorrhage and do not undergo surgical treatment. The bleeding episodes are reported to be fatal in 78% of patients. The overall mortality rates for patients surviving the initial hemorrhage are 18% at five years, 31% at 10 years, and 45% at 20 years. That is to say, 18% will have died at a point five years after the initial hemorrhage; 31% will have died at 10 years and 45% at 20 years after the initial hemorrhage with all deaths having been related to a recurrent hemorrhage. There is another way that Aneurysms are now coming to our attention. There is an increasing frequency of "Incidental Aneurysms." This term refers to the fact that the Aneurysm has not yet either hemorrhaged or caused any other difficulties. The presence of the Aneurysm is usually identified on one of the newer "Brain Scan" techniques that are being done to investigate some other problem. For example, your physician may request a CAT (computerized axial tomogram) or MRI (magnetic resonance imaging) scan either to investigate a possible blood clot after a head injury or for some other problem. These scans may "incidentally" identify an Aneurysm. Scans that are being done to investigate the complaint of headaches may uncover an Aneurysm, which may or may not have anything to do with the cause of headaches. There are several ways by which Cerebral Aneurysms can be identified. In patients who have suffered an Intracranial Hemorrhage, a CT or MRI Scan will usually confirm the clinical suspicion of a hemorrhage. Following that confirmation, some other forming of "neuro-imaging" procedure will be required in order to actually identify the presence and location of the Aneurysm. Magnetic Resonance Angiography (MRA), a methodology that uses Magnetic Resonance Imaging (MRI) technology, is useful as a primary method for "screening" patients who are suspected of having some intracranial (inside the head) problem with the blood vessels to or of the Brain. MRA is not capable of providing sufficiently clear anatomical detail for definitive diagnosis or surgical planning in most patients. CT Angiography (CTA) is also available in many institutions. These are the technologies that would customarily be used in patients who HAVE NOT HAD A HEMORRHAGE but are suspected of harboring an Aneurysm since they are "non-invasive" and still provide images of the blood vessels of the Brian. Aneurysms can only be fully evaluated by a radiological (X-ray) investigation called an angiogram or arteriogram. This test allows us to evaluate all of the arteries of the Brain (as well as the blood circulation pattern of the Brain including the veins). The Neurosurgeon will want to see several different views of the Aneurysm and its relationship to the nearby and directly adjacent vessels. This test will also help to identify if any other Aneurysms or other cerebral blood vessel problems are also present. Angiograms are usually performed by a Neuroradiologist. This physician has special training and competence to conduct these investigations. Although these tests carry with them some risks, they are small compared to the benefits gained for the patient. In the hands of a competent Neuroradiologist, the actual risk rates are very small. 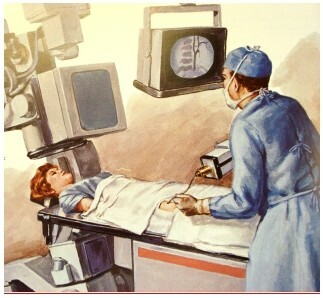 A Neuroradiologist is conducting a Cerebral Angiogram (under x-ray guidance) by manipulating a long catheter introduced through the groin artery and "floating" it towards the Cerebral Arteries. A "dye" substance is injected through the catheter which fills the Brain's blood vessels permitting images to be obtained using x-ray techniques. 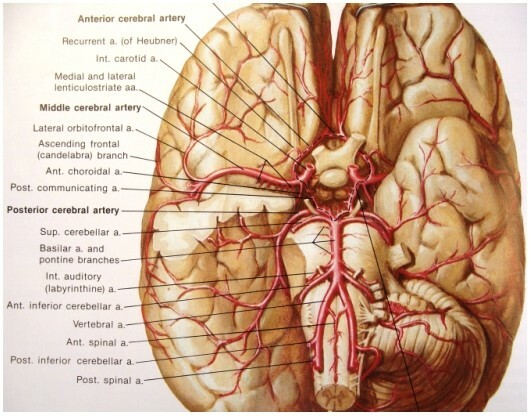 The Posterior (back) Brain circulation comes from the two VERTEBRAL Arteries which join each other inside the head to form the very important BASILAR ARTERY. This vessel, in turn, sends numerous small and several important large vessels to the Brain Stem (Medulla, Pons, and Midbrain) and Cerebellum (the balance and motor coordination center of the Brain). The BASILAR Artery ends where it forms the two (2) large POSTERIOR CEREBRAL (back of the Brain) Arteries which go to the back of the Left and Right Cerebral Hemispheres. 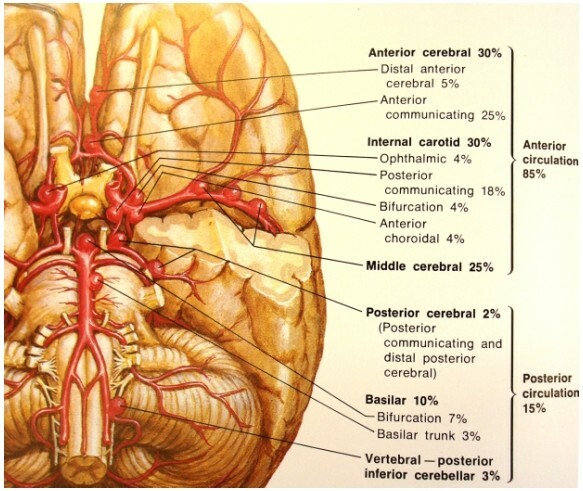 These Posterior Cerebral vessels supply the Occipital Lobes of the Brain which are responsible for our sense of SIGHT. At the base of the Brain there is a remarkable interconnecting system of these major arteries which allows communication between the Anterior (front) and Posterior (back) arterial circulation systems as well as the Right and Left Hemispheres' Systems. This circular interconnection of arteries is called the CIRCLE OF WILLIS. (It is named for the anatomist who described it.) The Circle of Willis is very important for a number of reasons. It allows the Brain an alternative way to keep blood flowing to every area even if one or more of the major blood vessels (supplying blood to the Brain) were to shut down (such as may occur in atherosclerosis  hardening of the arteries). The Circle of Willis may be very important in planning surgery for some Aneurysms since we may have to rely on it to provide a detour route for an adequate blood supply in order to eradicate some Aneurysms. Unfortunately a "complete" Circle of Willis is present in only 40% of patients. In the other 60%, there is some deficiency in part of the "Circle." That does not mean that it is "BAD"; however, when the surgeon is planning the approach to "clip" the Aneurysm, it is often important to know if an alternative route (detour) of blood supply is available or not. Surgery can usually be done successfully in spite of a deficiency in the "Circle"; nevertheless, it is best to have as accurate a "road map" of the cerebral circulation as possible. This information is only part of what is learned during the ANGIOGRAM (arteriogram). Figure 6: Anatomical distribution and relative incidence of Intracranial Aneurysms. 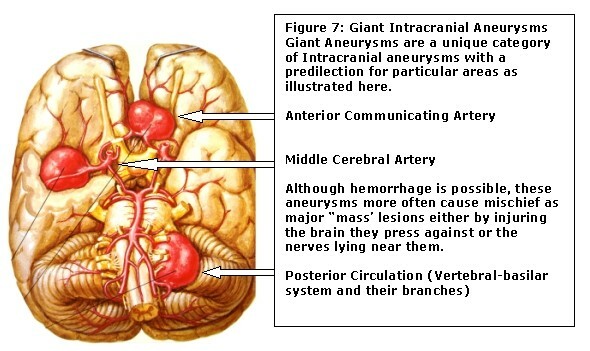 Intracranial Aneurysms can occur on any of the arteries of the Brain. However, there is a strong predilection to certain locations. Most Aneurysms occur in association with the larger Cerebral Arteries and are in the region of the base (underneath) portion of the Brain. Eighty-five percent (85%) of all Intracranial Aneurysms occur in the Anterior circulation (Carotid, Anterior and Middle Cerebral Arteries) while Fifteen percent (15%) involve the back circulation (Vertebral, Basilar, and Posterior Cerebral Arteries). In the Anterior (front) circulation approximately 30% of Aneurysms involve the Internal Carotid Artery while 30% involve the Anterior Cerebral Artery and another 25% involve the Middle Cerebral Artery. The remaining 10-15% of anterior circulation Aneurysms involve some of the smaller branches of each of these major vessels. In the Posterior circulation system most of the Aneurysms involve the Basilar Artery, usually near the area where the left and right Posterior Cerebral Arteries originate. However, Aneurysms can occur anywhere along the Basilar Artery and may involve or incorporate (in the Aneurysm) vital blood vessels which nourish the Brainstem. Giant Aneurysms are a "different category" within the broad range of these structural problems. Although these Aneurysms can be the source of a hemorrhage, they are more likely to cause problems such as Seizures (Epilepsy), impaired or double vision, symptoms and neurological signs related to injury to Cranial Nerves or as a "Mass Lesion" pressing upon Brain structures. Among the important differences from small Aneurysms, these giant Aneurysms tend to have a much thicker "wall" which may be partially or entirely "calcified" (as part of a degenerative process similar to atherosclerosis-hardening of the arteries). A large calcified mass (See Figures 1 & 7-11) pressing on vital Brain and Cranial Nerve structures while, at the same time is an integral part of the blood supply to Brain makes for a considerable technical challenge to the Microvascular Neurosurgeon. 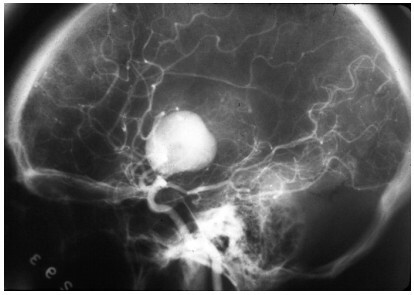 Figure 8: Cerebral Angiogram demonstrates a Giant Left Internal Carotid Artery Aneurysm that involves the origin of the Left Ophthalmic Artery. 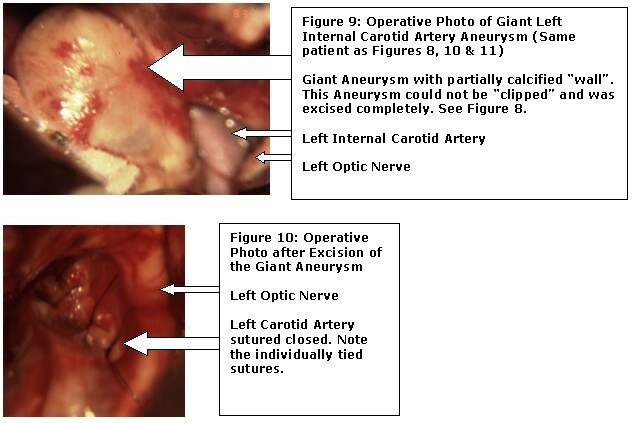 Figure 11: Giant Internal Carotid Aneurysm after removal. It is no longer "tense" since there is no blood coursing through it. The walls have not collapsed due to their thickness and partial calcification. When an Aneurysm ruptures, blood leaks out of the artery and surrounds the Brain tissue in the space where Cerebrospinal Fluid (CSF) normally circulates called the Subarachnoid Space. The hemorrhage is often referred to as a "Subarachnoid Hemorrhage". This condition is known as an "Aneurysmal Bleed". It can cause sudden, severe headaches or even a life-threatening coma. Some severe hemorrhages may result in destruction of brain tissue, an Intracerebral Hemorrhage. In actuality there is a team of physicians (neurosurgeons, neurologists, neuro-radiologists, neuro-ophthalmologists and intensive care specialists) and nursing staff as well as other health care professionals (such as speech therapists, physical and occupational therapists, neurophysiologists, etc.) who are involved to varying degrees in the care of Aneurysm patients. Depending on the individual needs of the particular patient, these Neuroscience staff personnel will contribute to that patient's treatment. Once an Aneurysm has been detected, it is usually considered best to repair it rather than risk the dangers of a ruptured artery. Repair of Aneurysms requires a dedicated team of specialists who have a variety of techniques available including direct surgical repair, endovascular repair as well as trapping and arterial bypass procedures. In medicine, there are usually some reasonable choices in the care of most diseases. Sometimes the treatments carry with them more risk than the disease itself. In diseases which themselves are very serious, the treatments are frequently also quite serious. That does not mean that the treatments cannot be or are not successful, but it does clearly mean that there are certain risks to not achieving a "perfect" result or to failure of the treatment. One must weigh all the factors involved in the particular patient such as the neurological condition, medical conditions that might interfere with successful treatment, as well as the actual disease and its risks together with the risks of the treatment, in deciding what the best treatment method is for that patient. The experience and capabilities of the physicians and surgeons in the treatment methods are also important factors. For patients who have suffered an Intracranial hemorrhage from a ruptured Aneurysm the "ideal" treatment result is the COMPLETE OBLITERATION OF THE ANEURYSM so as to prevent another haemorrhage. There are some options; however, all of these require some form of "invasive" intervention. The technologies underlying these endovascular procedures are still evolving. Among the problematic issues for any form of aneurysm treatment are the concerns for re-bleeding. 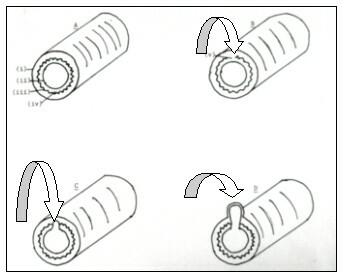 In the case of endovascular treatment, rebleeding can occur despite the apparent excellent placement of the "coils". A recent Editorial in STROKE (Gary J. Redekop, MD; 2006; 37:1252-1353) summarized an important scientific investigation regarding aneurysm treatments. "The International Subarachnoid Aneurysm Trial (ISAT) compared microsurgical clipping and endovascular coil occlusion in patients with ruptured aneurysms felt to be suitable for either technique. This study showed that the risk of late re-bleeding was low but more common after endovascular coiling than after clipping. There are concerns about the long term durability of coil occlusion as well as the need for follow-up imaging and further treatment if aneurysm recurrence is detected." Furthermore, this editorial commented that: "The Cerebral Artery Rerupture After Treatment (CARAT) study compared rates of recurrent haemorrhage in patients with ruptured aneurysms treated initially with coil embolization or surgical clipping. Significantly more patients treated with coiling required repeat treatment during the first year and continued to require additional treatment, although infrequently, as long as 5 years after the initial procedure." This is a matter of considerable importance since "serious morbidity occurred in 11% of patients undergoing repeat coil embolization and 17% of those undergoing repeat surgery." The point in sharing this information with you is to demonstrate that, clearly, there are significant advances that are being made in this field to improve the safety of the procedures as well as ensure a better long term outcome for these patients. Specific treatment strategies must be individualized, taking into account the patient's age, neurological status and other medical conditions as well as the specific anatomical characteristics of the aneurysm. These characteristics of an Aneurysm that help to determine the most efficacious interventional technique include its size, location, geometry, relationship to the parent artery or other adjacent arteries, the size of the dome and shape of the aneurysm neck, presence of calcification within the wall of the aneurysm and the presence of clot (thrombus) within the Aneurysm. A multi-disciplinary team that emphasizes an honest and unbiased collaboration between the surgeons and the interventionalists is critical in the decision making process for the successful treatment of these patients. There are some circumstances that occur which will result in a recommendation for early surgical treatment. In these cases, the operation is usually carried out within the first forty-eight (48) hours after the initial hemorrhage. We are trying, in these situations, to reduce the risks to life related to repeat hemorrhage by obliterating the Aneurysm before it can do harm again. However, there are some additional risks to this "early surgery". There is a significant likelihood that "vasospasm" (spasm or narrowing of the blood vessels of the brain) will occur in the "early" operations. (See Page 15, Part 2, of our ANEURYSMS monograph for further discussion of vasospasm.) However, one additional major advantage to the early clipping of the Aneurysm is that, in the event that vasospasm occurs, we can "artificially" raise the blood pressure with medications and try to "drive" blood through the narrowed arteries. Obviously this technique of raising blood pressure could not be used to treat vasospasm unless the Aneurysm was already clipped since raised blood pressure would be expected to cause a hemorrhage from an unclipped Aneurysm. Another possible technique to overcome "focal" spasm is through another angiographic maneuver called Endovascular "balloon angioplasty". In this instance, a balloon catheter is used to "dilate" the segment of a vessel that is in spasm. (This can ONLY be done AFTER the Aneurysm has been surgically "clipped".) This is another example of the advances available using Interventional Neuroradiology techniques. For most patients with an Intracranial Aneurysm (most particularly those who have already suffered a hemorrhage), the treatment of choice is to obliterate or occlude the Aneurysm. The goal of these interventions is to stop blood from going into the Aneurysm while preserving the blood supply to the Brain. The Endovascular Interventional techniques were described previously. 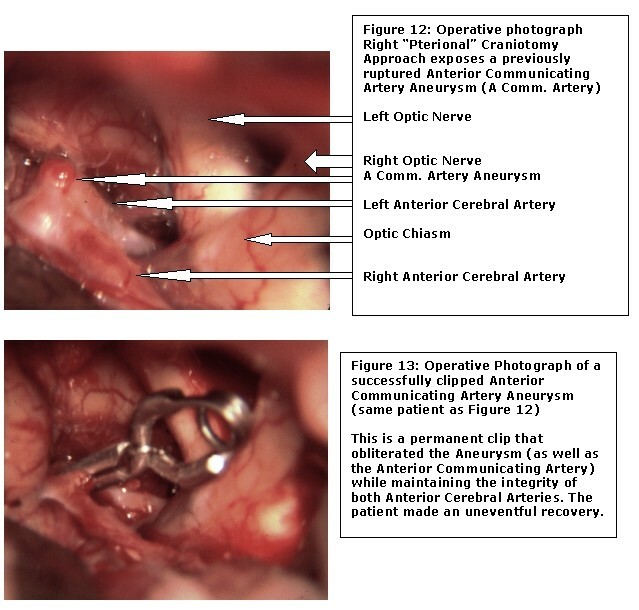 The surgical method to accomplish this results in applying a specially designed metallic "Aneurysm Clip" in such a way that isolates the Aneurysm from the artery. When blood can no longer get into the Aneurysm (the weak spot), then it can no longer hemorrhage. The clip is permanent (See Figures 13 & 14). The remainder of the Aneurysm wall beyond the clip shrivels up and usually scars. Occasionally we must use more than one clip to successfully occlude the Aneurysm. There are some Aneurysms which actually have to be cut out and the blood vessel sewn up (a technique called "aneurysmorraphy") (See Figures 8-11.) This is more hazardous and is rarely required. Other unusual Aneurysms cannot be completely clipped (usually because to clip them entirely would result in the sacrifice or injury to another important artery and thus produce a stroke). In the event that only part of the Aneurysm can be clipped, the surgeon will attempt to reinforce the remaining segment of Aneurysm in some fashion (usually with a rapidly setting glue substance). An alternative for some other situations is to "trap" or excise the Aneurysm and reconstruct the blood supply to the Brain by creating an Arterial Bypass Graft. 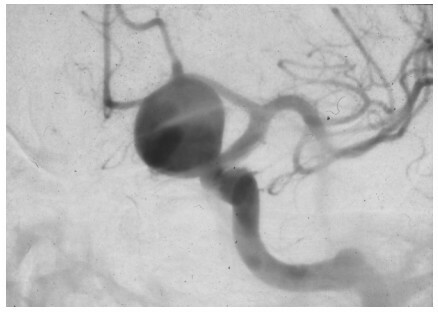 Figure 14A (Left): Operative Photograph of Left Middle Cerebral Artery with Multiple Aneurysms. The Aneurysms have been clipped while sparing the vitally important parent vessels (Arrows). Compare to Figure 14B. Figure 14B (Right): One of the "Clipped Aneurysms" has been opened, drained of blood and collapsed (Curved Arrow). This is dramatic "proof" that the Aneurysm has been obliterated and "cured". The same technique will subsequently be used for the second Aneurysm (Straight Arrow). Although the ideal method (to permanently stop all blood flow to the entire Aneurysm) is usually accomplished, it is not always possible to achieve the ideal. In these cases, we strive to reinforce the wall to provide a stronger wall for the part of the Aneurysm that remains. In some unusual cases, surgery cannot be completely or even partially accomplished. Sometimes we find that the clipping of the Aneurysm (or coating it with glue to reinforce the weak blood vessel wall) would have a high risk to produce a profound neurological injury or death. In these rare cases (and those where surgery is not being done), the patient assumes the risks of the natural history of the disease. Regrettably, physicians cannot cure everyone and even modern treatments are not always completely successful. Please see our Downloads & Information section for additional information in our comprehensive ANEURYSMS monograph.